Revered maximum leader Fidel Castro has decided to demit office as President and Commander-in-Chief of Communist Cuba due to ill health. While the Bush Administration in the United States is euphoric to see Castro finally off the anti-America radar screen, the geo-political achievements/milestones of Comrade Fidel Castro “can’t be wiped away so easily” nor be down-graded. 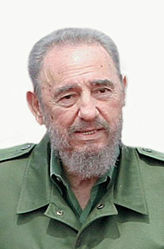 Fidel Castro came to power in Cuba through armed revolution. He overthrew the pro-United States dictatorship of Fulgencio Batista on 1st January 1959. President Castro then proceeded to take the riches from the rich and give them to the poorest of the poor. The descendants of those rich, capitalist Cubans, now reside in Miami, U.S.A. They still harbor supreme acerbic anti-Castro sentiments.